Brrr, it’s cold outside and I’m ready for some comfort foods. When I saw a recipe for Scotch Potatoes in the January, 1916 issue of Ladies Home Journal, I just had to try it. 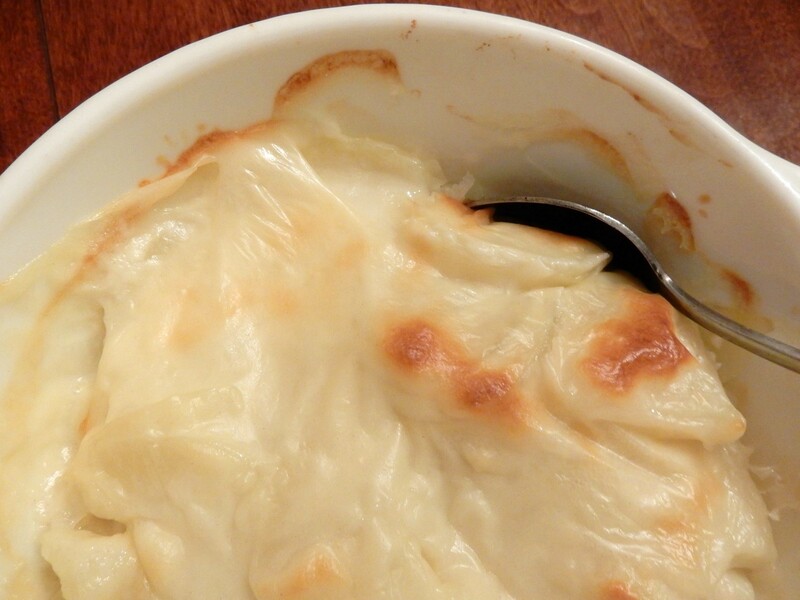 Scotch Potatoes are very similar to Scalloped Potatoes, but they contain a lot more onions. The recipe calls for a 1:1 ratio of potatoes and onions (2 cups potatoes and 2 cups onions). This recipe was a winner, and I may never make regular scalloped potatoes again. Scotch Potatoes wonderfully pairs the creamy potatoes with the sweet, bright, complex flavor and texture of the onions to create a lovely taste sensation. The recipe I typically use for Scalloped Potatoes just has me put the raw potato slices into the casserole dish and then pour white sauce over it. When I bake that casserole I often struggle to get the potatoes tender before the top gets overly brown. One of my favorite things about the Scotch Potatoes recipe is that I had no issues with a burned top and under-cooked potatoes. This recipe called for boiling the potatoes and onions for a few minutes before putting them into the baking dish. This worked perfectly—and I now wonder why I never thought of doing this before. Preheat oven to 400° F. Put the sliced potatoes and onions into a saucepan, and cover with water. Add 1 teaspoon salt. Bring to a boil, then reduce heat, and simmer until the potatoes are just barely tender (about 12 minutes). Remove from heat and drain. In the meantime, make a white sauce by melting the butter in another saucepan. Stir in the flour, 1/2 teaspoon salt, and pepper. While stirring constantly, slowly add the milk. Continue stirring until the mixture is hot and begins to thicken. Place the cooked potatoes and onions in a baking dish. Pour the white sauce over them, and put into the oven. Bake for 25 minutes, or until hot and bubbly, and the top begins to brown. Remove from oven and serve. I didn’t make my potato and onion slices as thick as the slices called for in the original recipe. Mine were about 1/4 inch thick, and they worked beautifully in the updated recipe. Posted on December 26, 2015 December 28, 2015 by SherylPosted in FoodTagged onions, potatoes, recipe. Had some scalloped potatoes yesterday! Made with Boursin! Delicious, but the cook also had some problems getting them all done enough. Scalloped potatoes can be challenging sometimes. 🙂 The Boursin sounds like a wonderful addition. A lovely sounding recipe that I’ll have to try soon. I think that you’d like it. It’s a very nice recipe. Not a big fan of onions but great idea to parboil the potatoes even for regular scalloped potatoes. For me the biggest take-away from trying this recipe was that boiling the potatoes for a couple minutes before assembling in a baking dish really improves the outcome. The onions are a wonderful addition to the recipe. I think that you’d really like it. This looks and sounds yummy! I’m a fan of anything “potatoes”! Thanks for sharing; hope your Christmas was wonderful. It is delicious. It’s been I wonderful holiday season for me. And, I hope that you also had a wonderful Christmas. Very nice, thank you.But we are ready to get back to the regular routine! I rarely cook a potato any more, but I brought some leftover ham home from Christmas dinner, and it occurs to me that this would be a perfect pairing. There’s no reason the ham couldn’t be added to this recipe. I’m going to give it a try, anyhow. Ham would be a nice addition. It sounds like a winner to me. I love potatoes and onions. I am going to have to try this. I think that you’d enjoy it. Great idea to boil the potatoes and onions for a few minutes. I am definitely going to try this recipe. It’s a very nice recipe. I think that you’d really like it. I like this recipe. We like onions at my house. The onions are a nice addition to this recipe. There are so many different cream-based recipes–and they probably go by different names in different regions. If the sauce contained cheese, I would call them Au Gratin Potatoes. I don’t think I’ve ever seen such lovely potatoes. I had a friend who called her recipe Scotch Potatoes but were nothing like these. It makes me wonder what kind of recipe she was using. Interesting. 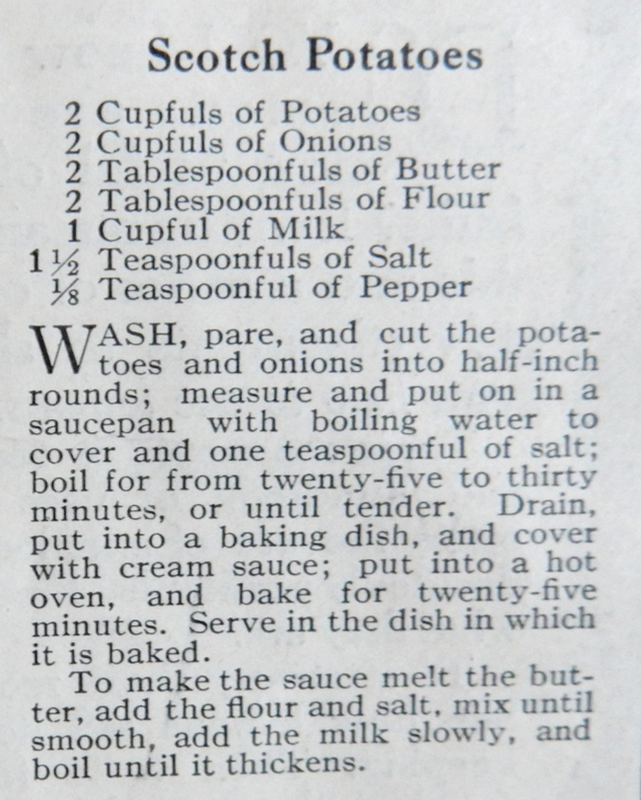 . . I’d never heard of Scotch potatoes until I saw this recipe in the old magazine. Here’s were full of vinegar and bacon bits. So it was a completely different recipe. It sounds somewhat similar to a hot potato salad. Yes, this is printed and waiting in my Will Do pile. Looks perfect! It’s an excellent recipe. I think that you’ll enjoy it. A vintage! Thanks for sharing! You’re welcome. Old recipes are so much fun. I usually add onions to scalloped potatoes, but I don’t boil them first. I just cover the pan with baking paper and foil for the first 30-35 minutes of baking, then uncover and continue baking until done. The bottom potatoes are always perfectly cooked this way. Thanks for the tip. The baking paper and foil sounds like a really easy way to get evenly done potatoes. And to think a hundred years later, that recipe is still being used ,my Mom would make this ,occasionally added some spam to it. My family doesn’t care for spam, so back to the original way of making it. It is amazing how some of the classic recipes are still made–and it’s also interesting to see how it was adapted. The addition of Spam probably “modernized” the recipe mid-century. Sounds great! I will try this as I like potatoes in any form. I made regular mashed potatoes to go with ham for Christmas. All the best to you in 2016! I also enjoy potatoes in most any form–especially during the winter months. Happy New Year! Boiling the potatoes a little before putting them into the casserole dish really worked well for me. It wasn’t very difficult to do, and it really improved the outcome. The potatoes and cream sauce nicely balance the onions–so the onions taste is fairly mild. That said, it you don’t care much for onions, I’d probably reduce the amount of onions and increase the potatoes to compensate when making this recipe. Your photo stopped me in my tracks! YUM! It’s nice to hear that you liked the photo. My family doesn’t like onions, but I do. I’ll have to make this for myself sometime. It would be easy to divide this recipe in half to make a smaller dish. yum!! I just wish it was cold here, but unfortunately as I write, the doors are open and welcoming in the 70 degree weather. It truly is beautiful, but I miss a cold Christmas! 70 is too warm for Christmas! That said, it’s much colder here, and 70 sounds wonderful. It’s a very nice recipe.. Sounds like a great recipe. I think the 12 minutes of boiling would work better than 30 minutes of boiling and then 20 more in the oven. Might make it today. It seems like the potato slices wouldn’t hold their shape, and would just go to mush, if boiled for 30 minutes. It’s a very tasty dish. I think that he’ll like them. Great find, looks and sounds delicious! Thanks! It’s nice to hear that you liked this post. This recipe, I still need to make. I would have thought that there was garlic in here? It is not, but I still will make it! Ha! I think that garlic would be a wonderful addition to this recipe–maybe you should just throw a little in. I’ve seldom seen garlic used in hundred-year-old recipes that were published in U.S. magazines and cookbooks. I’m thinking that garlic wasn’t very popular in the U.S. a hundred years ago. I have no idea why. This sounds delightful! I am going to try this weekend! This recipe is delicious. I’ve made Scotch Potatoes several times since I posted this recipe.